The Membrane Study Group (GEM) and Club Exocytose-Endocytose are two French societies that regroup researchers in the fields of membrane biophysics and membrane trafficking, respectively. 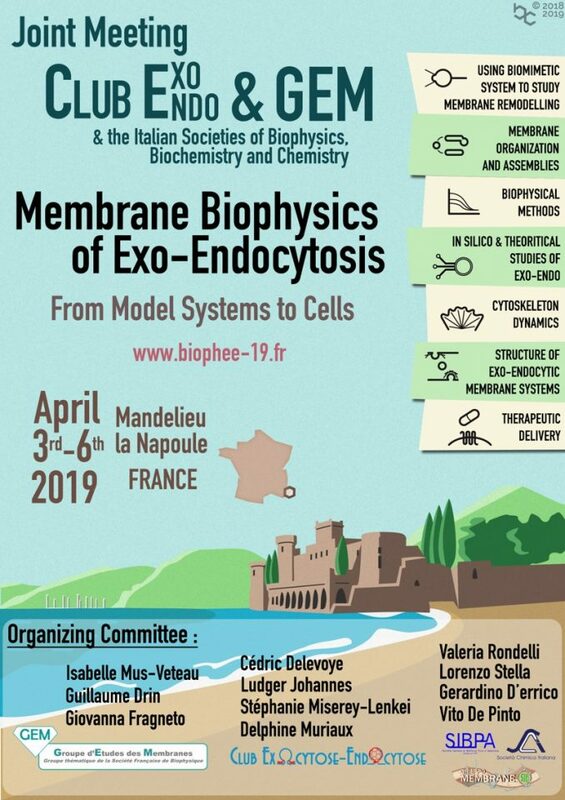 With the participation of the Italian societies of Pure and Applied Biophysics (SIBPA), of Chemistry (SCI) and of Biochemistry and Molecular Biology (SIB), for the first time a joint meeting will be held entitled « Membrane Biophysics of Exo-Endocytosis: from Model Systems to Cells ». The goal of this international meeting is to illustrate how novel opportunities for discovery in the life sciences arise when the most urgent challenges in the field of exo and endocytic membrane trafficking are addressed from fresh angles based on innovative biophysical tools and concepts. This meeting will take place from April 3-6, 2019, in the region of Nice on the sunny French Riviera in the South of France. It will be limited to a maximum of 150 people in a format that encourages interactive discussions of latest research in these areas, with much room for contributions from young scientists. Prizes for the best posters will be awarded. GEM and the Italian Societies will award travel grants to several students selected on the basis of their CV and scientific abstract. This congress will take place at the Pierre & Vacances holiday village in Mandelieu. This superb and attractive location (close to Italy and 30 minutes from Nice-Côte d’Azur airport) is particularly well suited to this type of event. Indeed, this site groups together the conference and poster rooms, catering and accommodation, thus promoting discussions between delegates.